...And we are back from a weekend wedding in Palm Springs! The wedding that took place at The Colony Palms Hotel and it was a beatiful success. 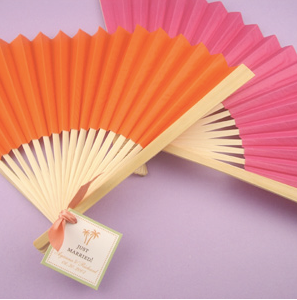 With all of the Palm Springs sunshine we thought we would bring to your attention a thoughtful touch the couple had for their guests. At each seat for the ceremony we placed a beautiful personalized paper fan. 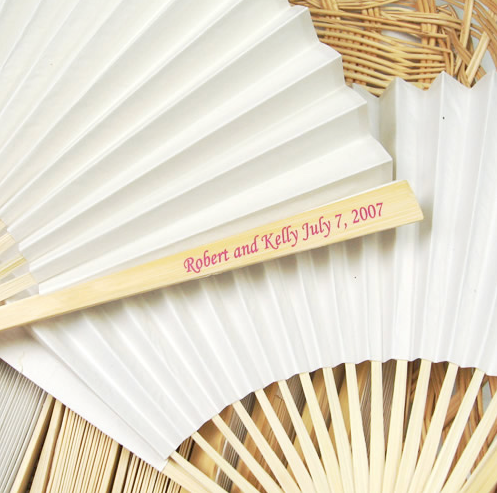 On the wood frame part of the fan, the couple had their names and their wedding date. What is great about this idea is that the fans acted as a favor and also lended a practical use. We love that the couple wanted to make sure their guests were calm and cool for the outside event.